I'd never even heard of Maxibon bars. You all know I love a bundt shaped challenge, but when my friend Wayne suggested an ice cream bar themed birthday cake, I had to do a bit of research. This involved a trip to my local Tesco, purchasing a box, and eating two in my lab coat (read pyjamas) to check for flavour, consistency and aesthetic. I saw my challenge, and accepted it. It comprises of rich vanilla ice cream with chocolate chips, half drenched in chocolate with hazelnuts, the other half with Maxibon biscuits. Easy gig. The melted ice cream bar will help transform your cake from a vanilla sponge, to actually tasting like the genuine article, so don't skip this. This is bundt alchemy, bakers. Embrace it, Snape would be so proud. Needless to say that this cake got a bit of a laugh as well as destroyed. Mission accomplished! Prepare a regular sized bundt tin - 2.4l, 10 cup, 10 inch with Cake Release spray/melted butter, and dust with flour. In a separate bowl, measure out the flour, bicarbonate of soda, salt and chocolate chips. Pour the yoghurt and vanilla extract into a jug. Tip in the chocolate chips which are now covered in flour, which will stop them from sinking like stones! Stir in the melted Maxibons. Tip your batter into your prepared bundt tin. When the cake is fully cool, melt your chocolate spread in the microwave until it's quite runny. Stir in the chopped hazelnuts. 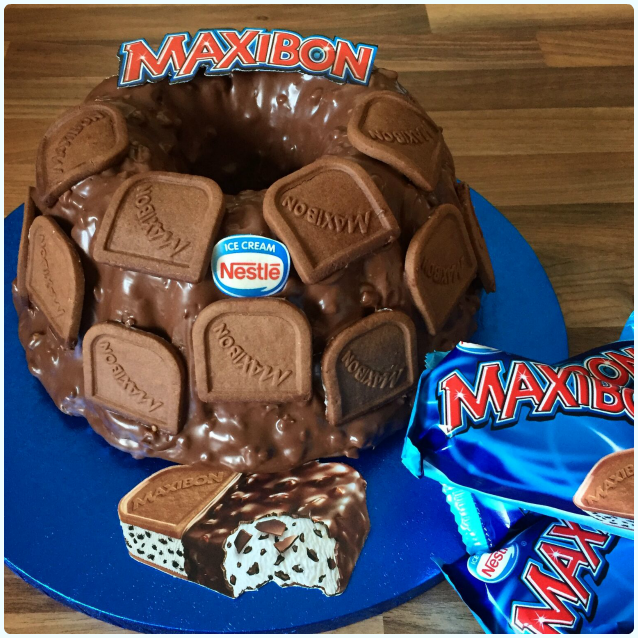 Decorate with your Maxibon biscuits, and bits of the box if you so please!